This week’s post took some thought. Not because I didn’t know what to write about but because my views on the subject, especially within the Korean Martial Art Community, might not be viewed in a favorable light. I want to talk about the Kihap 기합 (Kiai in Japanese). For those of you that don’t know, it’s the “yell” you hear martial artists making during sparring, forms, breaking, etc. The word Kihap comes from two Chinese characters: 氣合. Qi (氣), which means “breath” or “spirit” is commonly translated as “energy” in English. Hé (合), means “to combine”, “to unite” or “to join”. The two radicals that combine to form “合” are “亼”, meaning to assemble or to gather together, and “口”, meaning mouth (interesting). So Kihap literally means “to unite energy”. A Kihap is a vocal exhalation emanating from the danjeon 단전, the energy center of the body (a future post). If you ask several masters, “Why do we Kihap?”, you will get several answers. None of them are wrong but if you only listen to one or two of them, the benefits of Kihaping will be greatly decreased. So what are these reasons? If a martial artist only views a Kihap as a way of intimidating an opponent or psyching himself up, any loud noise will do. It is truly amazing the variety of very loud and very scary sounds you hear at martial art tournaments (some are more funny than scary – maybe they want their opponents to laugh). The problem is that only about a quarter of these Kihaps can be correctly used to force a free-flowing exhalation or to improve focus. Why? Because, only Kihaps ending in a vowel (there are a very few exceptions to this) do not restrict the flow of the breath on the exhalation. Try it. Try making some of the various Kihaps you have heard. If they end in a consonant, you will feel a restriction in your exhalation. A correct Kihap must end in a vowel. Whenever there is a restricted airflow, there is a potential to damage the lungs (Pulmonary Barotrauma). Think about it this way, take a large balloon and place a very small hole in it (so that the air is editing the balloon but slowly). Now sit on the balloon. What happens? It pops even though air is coming out of the balloon. Now I realize that this is a far cry from slightly restricting your airflow, by Kihaping incorrectly, and that your lungs are not going to pop, but it isn’t very difficult to injure them. Think about all the pressure a martial artist’s muscles place on the lungs when executing a technique, or when they hit a stack of bricks or when they get kicked by an opponent, any restriction in the airflow can cause damage to the lungs. Shin Ho Kwan has three basic Kihaps. Each one is used with a specific class of techniques and all of them end in vowels. 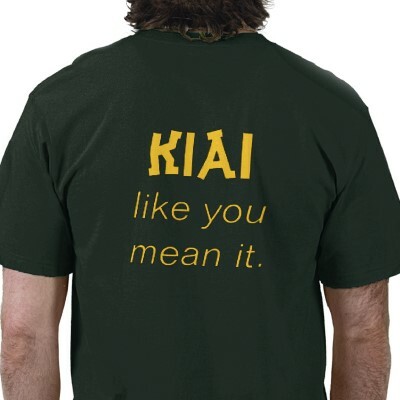 – The first Kihap is “Ā”. It sounds like the word “eight” without the “t” on the end. – The second Kihap is “Ō”. It sounds like the word “oh”. – The third Kihap is “Ē”. It sounds like “eeeeeeee”. The easiest way to describe the techniques these Kihaps are used for is by looking at three different strikes with a short stick. If you put the end of the stick on a target and push, the second Kihap is used. If you hit the target with a fast out and back motion with the stick, the third Kihap is used. If you hit the target but don’t retract the stick after impact or hit through the target before retracting the stick, the first Kihap is used. – If you reverse the two Chinese characters for Kihap, 氣合, you get Hapki 合氣, or Aiki in Japanese, as in Hapkido, or Aikido in Japanese.